Sometimes you are so busy with expanding your business, that you forget about the importance of online presence - until you discover you absolutely need a website to be seen and taken seriously. This was precisely the case with Ivy District - a modern district in Pearland, Texas that had everything but a website. We are always striving to create the best web design for our clients and the only way to do that is to start with thorough research. 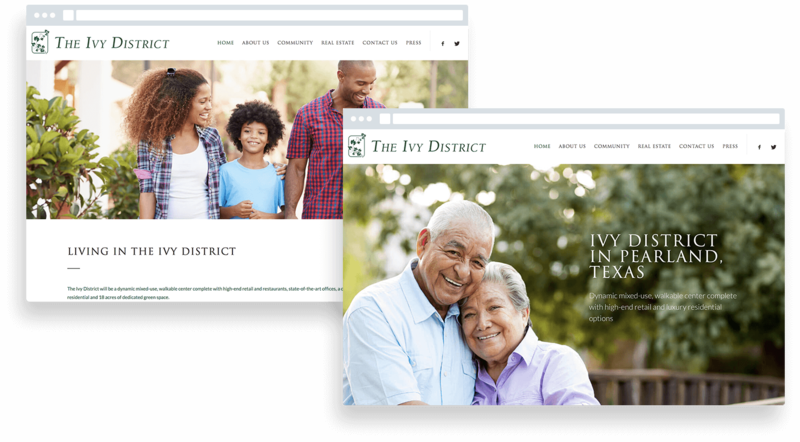 Though Ivy District were in a hurry to launch their website so that they could include it in their marketing strategy for presenting their center, we never agree to a time frame unless we are certain we can research the industry and the unique features of our clients. For different businesses operating in various industries, we focus our research on unique factors; for Ivy District, we knew the key to success would be appealing to certain demographic groups that would be looking for the kind of lifestyle this district offers. For Ivy District, this included young professionals, families and even the elderly, but what was common is the target market in all those groups would be people who look for serene, high-end living that offered a way to relax and socialize. Once we identified that target market, we decided to let the website design speak to them rather than overpowering it with content. Minimalism is ideal when you are targeting people who do not want to waste their time and who make quick decisions. Simplicity, amazing images that evoke emotion, highlighting Ivy District’s amenities and great user experience made Ivy District’s website very popular and a great resource for potential clients. What also helped was the fact that the website features mobile responsive design, which speaks great to the younger audience who mostly browse the web on their mobile devices. 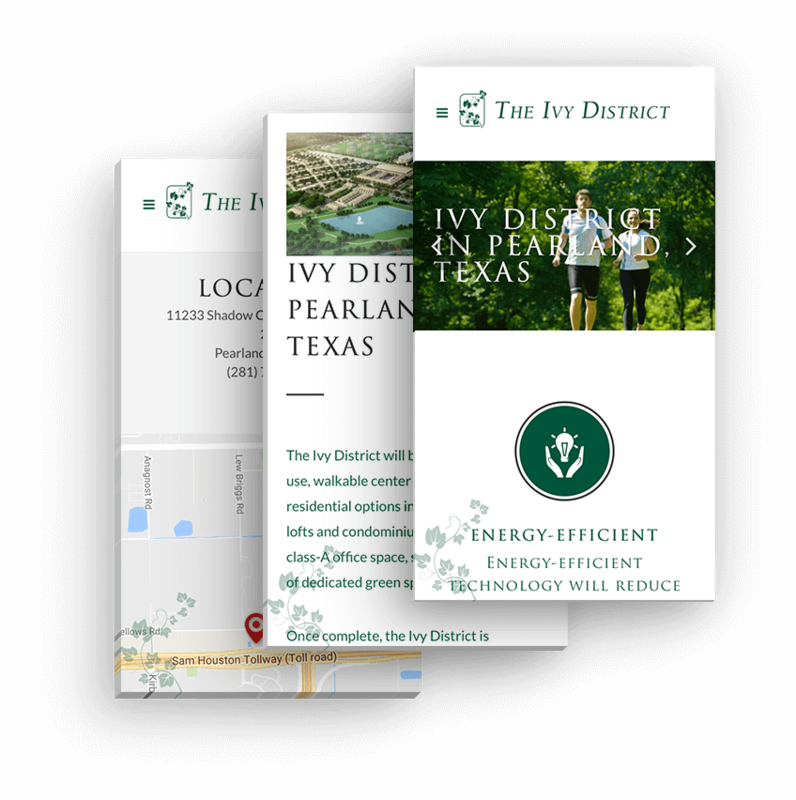 Ivy District is a state-of-the-art luxury residential and retail center located in Pearland, Texas. This modern development is built to be energy-efficient and offers a wide variety of high-end amenities to both business owners and residents, including lakefront views, vast green space, shopping, famous restaurants and more. Another great feature of the Ivy District is its location. This development is located minutes away from downtown Houston, Hobby Airport and the Texas Medical Center.